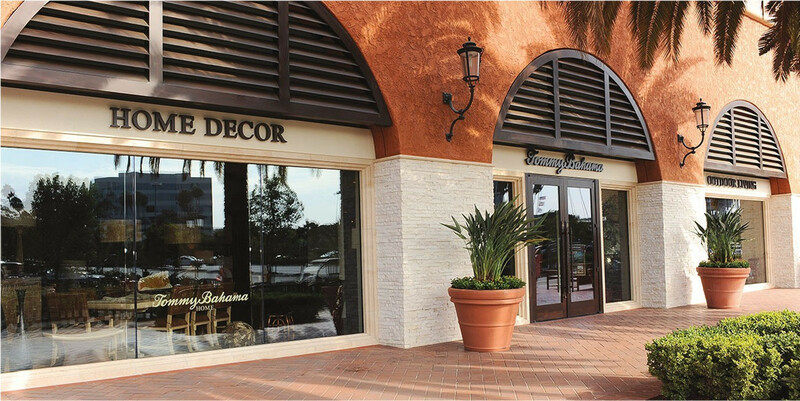 Located in Fashion Island, the Tommy Bahama Home store offers a unique array of fine home furnishings, outdoor living designs, home décor and accessories with the signature style of Tommy Bahama. The brand is iconic for its relaxed interpretation of casual elegance, which is reflected in remarkable lifestyle displays throughout the store that change weekly. Our talented design staff is available to assist on any design project, from refreshing a single room to furnishing an entire residence. Whether your project involves selecting a few items to enhance your current look or the redesign of an entire indoor or outdoor space, our talented designers are here to assist you. Visit our Fashion Island store or call to schedule an appointment. In-store design consultations are always complimentary. We’re here to help in laying out floorplans, selecting colors and patterns, suggesting solutions for storage and pulling the entire look together. Bring your plans, photos or the tear sheets that inspired you and allow our design staff to bring your vision to life. We also offer in-home appointments with one of our designers for a personal touch. In order to make the appointment as productive as possible, an initial in-store consultation is required. This allows the designer to understand the scope of the project and to get to know the look you’re trying to achieve. We charge a small deposit for in-home consultations, which may be applied toward any purchase in the store. Please feel free to come see us, call or send an email. If you are located outside the greater Newport Beach area, we’ll be happy to work with you over the phone or online. Our passion is designing inspired interiors and we would love the opportunity to work with you on any project large or small. 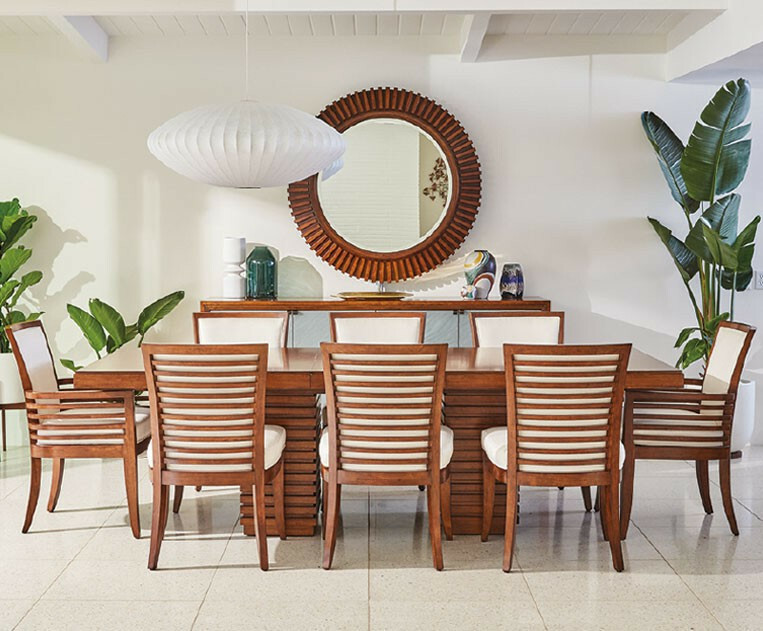 At Tommy Bahama Home, we design fine home furnishings, spanning a remarkable range of styles - from traditional to contemporary to refined island living. The lifestyles we create draw inspiration from the world’s most elegant and exotic destinations, incorporating unique materials like woven raffia, rattan, leather-wrapped bamboo, penn shell, abaca and lampakanai for distinctive one-of-a-kind looks. We offer home furnishings for every room of the home, including the home office and media rooms. 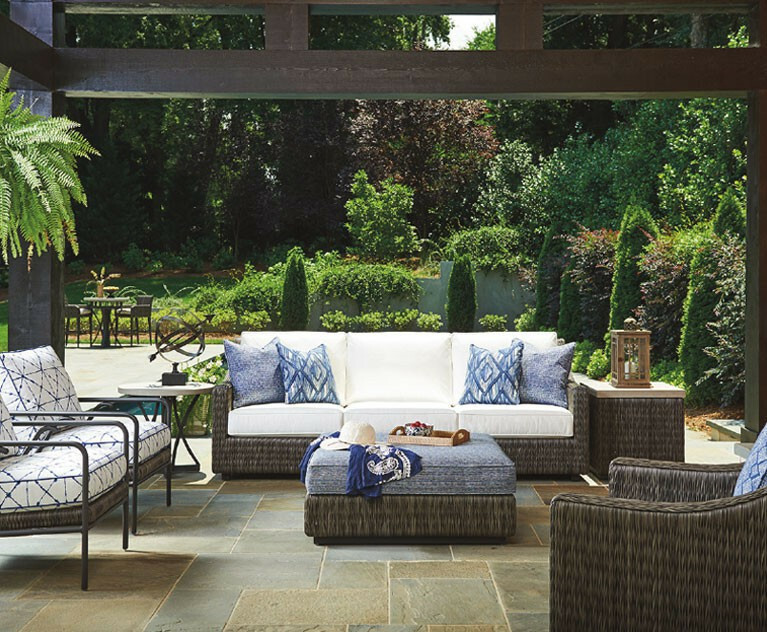 Tommy Bahama Outdoor Living was created to extend the brand’s signature style to include outdoor living spaces that have become a key entertaining area in today’s homes. 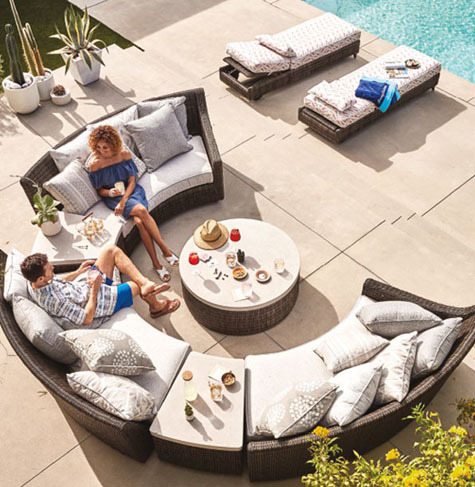 With bold styling, remarkable comfort and a wide range of custom options, Tommy Bahama designs allow you to create an outdoor retreat that becomes a natural extension of your indoor decor. Refined living should have no boundaries. Home decor is an elegant expression of personal style, and the items we select to enhance our surroundings should speak to that which inspires us. 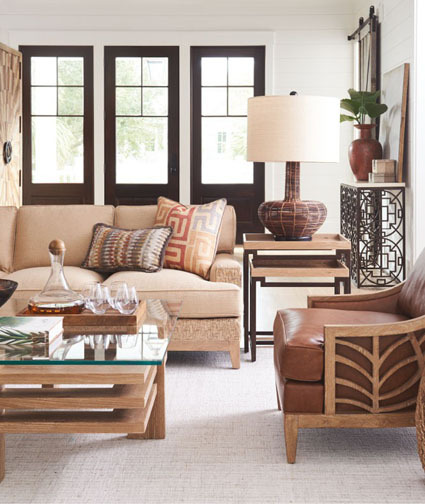 Tommy Bahama is legendary for its refined take on the art of relaxed living. 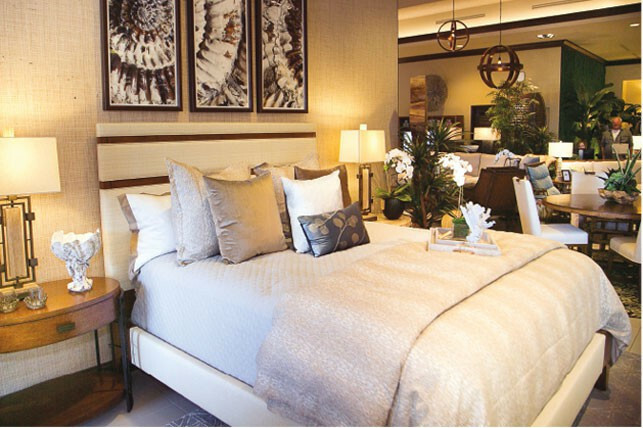 At Tommy Bahama Home, we offer a remarkable array of accessories - from candles to lighting to custom bedding ensembles. 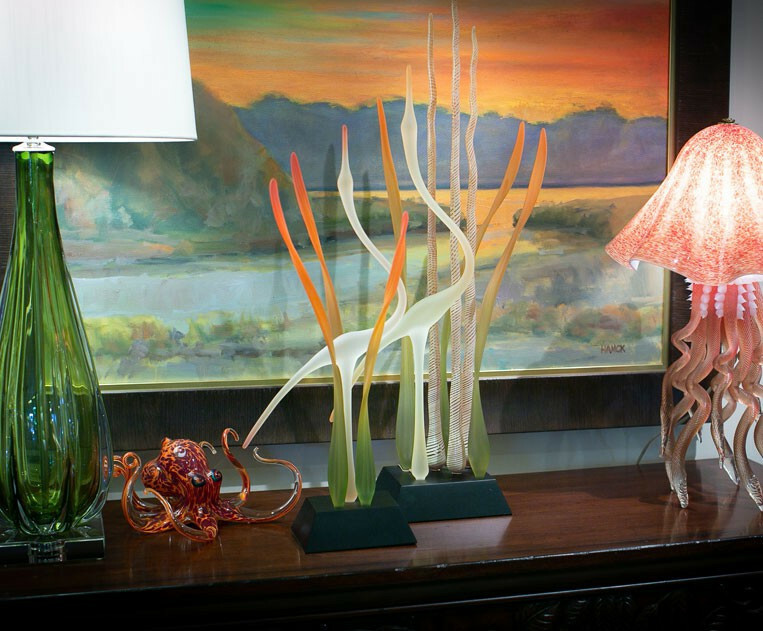 We also feature a unique assortment of handcrafted glass sculpture and original art commissioned by local artisans. We love the fact that every time you visit our store, you can expect to see something new and original. The Tommy Bahama Home portfolio is comprised of a remarkable range of styling across every product category, including outdoor living. The assortment is produced by Lexington Home Brands, one of the industry’s most respected manufacturers, with a legacy of craftsmanship spanning 115-years. 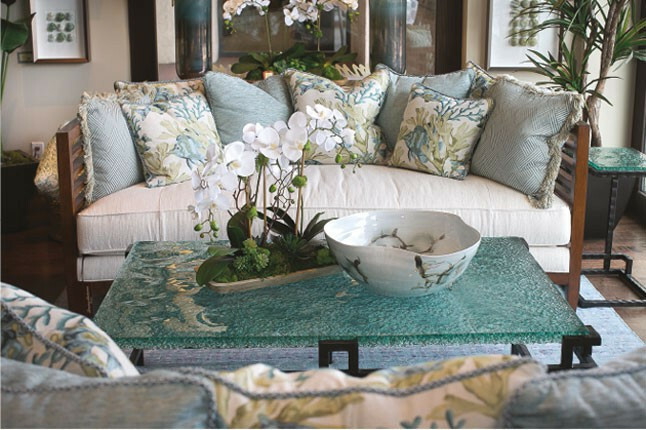 Other brands in the company’s portfolio include Lexington, Artistica Home, Barclay Butera and Sligh. The links below will showcase the product offering for each of these brands.